For many small business owners, offering employee benefits beyond those legally required is a “maybe someday” kind of thing. 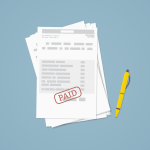 They take time and energy to set up and sap money from your revenue stream. But offering good benefits package now can pay off in a big way for your business down the line. 71% of employees who feel satisfied about their benefits also feel loyalty towards their employers—and are less likely to leave their jobs. Let’s take a closer look at some company benefits stats to see how offering employee benefits can help your bottom line. Offering benefits beyond those that businesses are legally required to provide can be a costly proposition, but, data shows, rewarding for your business in the long run. In fact offering more human centered-perks is one of this years top 5 workplace trends. 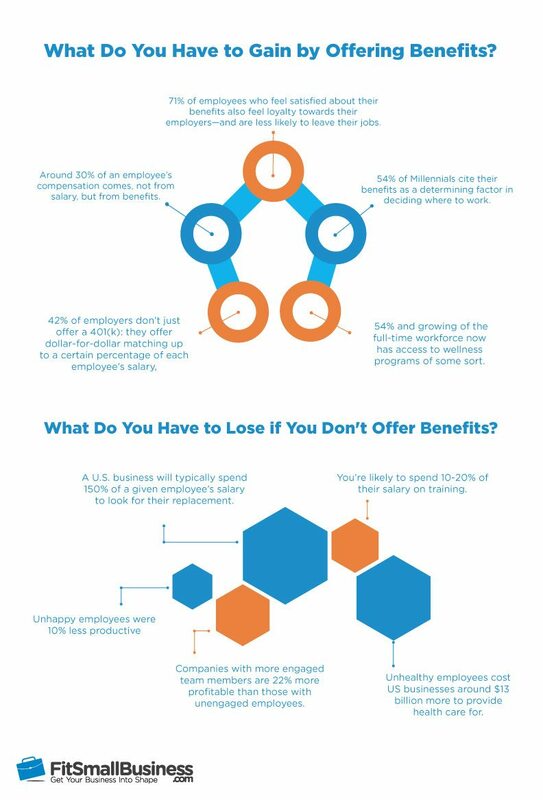 Let’s see three ways that your business can benefit from benefits! Employee benefits are a great way to attract new talent to work for your small business. Think about it this way: around 30% of an employee’s compensation comes, not from salary, but from benefits. And although different types of employees will have different kinds of needs, they will all want benefits that salary alone cannot provide. Whether that means investing in superior health plans or dental and vision, or retirement plans and life insurance, or offering commuter benefits, or even focusing on less monetary benefits that younger would-be employees might care more about (like open office hours, flexible vacation days, or annual getaways), you should know who you want to hire and what they want out of their jobs. For example, according to one study, 54% of Millennials cite their benefits as a determining factor in deciding where to work. That means you could be losing out on young, passionate employees simply because your benefits package is not competitive. And even if you are not aiming to recruit Millennials specifically, it is important to keep in mind that most other job-seekers are still heavily weighing your benefits package against competing offers. For another example, a whopping 42% of employers don’t just offer a 401(k): they offer dollar-for-dollar matching up to a certain percentage of each employee’s salary, according to one 2015 study. If you’re in the other 58%, you’re at a significant disadvantage when it comes to non-salary considerations. When it comes to your bottom line, recruiting can have a serious impact. Think about it this way: you’re looking for an employee because you have identified an area for potential growth that a full- or part-time worker could help you take advantage of. Beyond the time and energy you spend poring over resumes, conducting interviews, posting on job boards, and networking, you also have to deal with the opportunity cost of not pursuing those next steps for your business while you recruit. Benefits don’t just help you get employees—they help you keep them. First, in terms of losing employees to other companies. If another business comes along and offers your employee a higher salary, then you still might stand a chance if you offer strong benefits that relate to their needs. In fact, one 2015 survey found that 40% of employees would give up a wage increase in order to maintain their current level of health insurance coverage. That’s right: if the health insurance your business offers is good enough, you could actually protect your employees from being poached by other companies with higher salary offers. You also do not need to think only in terms of 401(k) and health insurance plans. If you tailor your company benefits to what your employees, specifically, need, then you will be miles ahead of the competition. Do they travel from far away or feel strongly about working for a green company? Think about setting up a commuter benefits program. Is your business focused on health and wellness? 54% and growing of the full-time workforce now has access to wellness programs of some sort, whether they be smoking cessation programs, weight loss training, or gym subsidies. Second, you can look at your benefits package and retention in terms of losing employees who are unhappy with your benefits. Although a competitive salary might be enough for some employees to stick around, studies show that 71% of employees who say that they’re happy with their benefits also say that they’re loyal to their companies. People want to feel like they are treated well—and benefits can go a long way to help. On the flipside, losing an employee for any reason can hit your bottom line hard. Beyond the opportunity costs brought up in the previous section, there are real financial costs to losing a member of your team. A U.S. business will typically spend 150% of a given employee’s salary to look for their replacement, although it depends on the kind of employee. Plus, for the first one to three years of an employee’s tenure (again depending on the position and business), you’re likely to spend 10-20% of their salary on training. If not offering adequate benefits or incentives is causing your employees to look elsewhere, then it may be time to bite the bullet. And if you think it’s too early to worry, then consider this: the smaller your business, the bigger the loss of an employee would affect you. Finally, besides helping you to get and keep the right employees, offering benefits can actually make those employees work harder, faster, and better. But we’re not kidding. Studies show that with the right mix of benefits, you can boost your business’s productivity—and bump up your bottom line. Again, there are two ways to look at the relationship between better benefits and increased productivity. First is the fact that, generally speaking, happier employees work harder. While this is an age-old maxim, the data proving it right has started to pour in—especially after the 2008 financial crisis. One 2010 study, for instance, found that the increased disengagement and lower job satisfaction many Americans reported actually led to $300 billion lost in productivity each year, and another report had this number pegged even higher, at as much as $550 billion. On the positive side, happy employees are more likely to work better and come up with new ideas. Another study finds that, specifically, happier employees were 12% more productive than average (and sometimes as much as 20% more productive over short periods of time), while unhappy employees were 10% less productive. Productive, in these cases, mean using time effectively: getting similar quality results on projects while spending less time. And there’s plenty of room for improvement: 87% of employees nationwide are not fully engaged with their work, which means your business could edge out the competition simply by treating your employees better. In fact, companies with more engaged team members are 22% more profitable than those with unengaged employees. While offering a benefits package isn’t the only way you can make your employees happier, it is an important one—especially when compared to factors like salary raises, which have not been shown to impact productivity through job satisfaction the same way. Whether this means occasional catered meals or company parties, meditation or yoga counselors, health and wellness programs, summer Fridays, management training with a focus on positive feedback, or some other benefits, the data is clear: improving your employee engagement can help your business thrive. The health of your employees. Of course, nobody likes it when their employees have to take sick days—it’s inconvenient, unpredictable, and no fun for anyone. But the health of your staff can have a serious impact on your business beyond those minor issues. In fact, American businesses lose between $150 billion and $225 billion each year due to employee illness. Unhealthy employees cost US businesses around $13 billion more to provide health care for. Plus, several states now require that employers provide a certain number of paid sick days for their employees. To add another layer of complexity, these revenue losses are not just due to sickness-related absenteeism. You can count on lower productivity when employees come in to work while sick, as well—and possibly spread their illness to others. Chronic conditions, like stress, obesity, or substance abuse, can contribute to the estimated loss of 115 productive hours each year as well. And small businesses with fewer employees, thinner margins, and smaller cash cushions will feel these effects especially strongly. Here’s where benefits come in. So while it might be tempting to just go with the cheapest, most barebones plan you are legally required to offer, settling on a better plan is an investment in your employees—and your business. 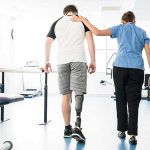 Finding the right health insurance plan can be a time-consuming and complicated process, but it is often well worth the effort in the long run. Secondly, there are other kinds of benefits you could offer that target health and wellness in less directly financial ways. For example, you could subsidize gym passes—or even build an employee gym space, if your business is big enough, since they actually pay for themselves within a couple of years. You could also offer incentives for employees to join weight-loss lunch programs, stick to certain diets, quit their smoking habits, offer coverage discounts or gift cards for healthy behaviors, and so on. Which Benefits Are Right For Your Business? The mark of a savvy small business owner is focusing on the now—while always looking ahead. Offering employee benefits, while seemingly an unnecessary cost today, is a large investment in the future of your business. But what works for one business may not work for another. Here’s how to choose a benefits package that make sense for your business. You need to make sure that you at least offer the employee benefits required by law. Please note that this is general information only. If you’re in doubt about which laws apply to your business, we recommend that you consult an attorney. Social Security taxes. Both the employer and the employee must pay these. The current rate is just over 6%, plus nearly 1.5% for Medicare taxes. Learn more about Social Security taxes, filing instructions, and hiring employees not covered. Unemployment insurance. Depending on your state of operation, you may have to insure your employees against job loss. Workers’ Compensation. Again, the specifics of what you need to pay for depends on your state, so make sure you’re aware of the regulations. Learn more here. Family and Medical Leave. You are required to give employees 12 weeks of job-protected unpaid leave due to reasons related to childcare, care of an immediate family member with a serious health issue, or care of the employee themselves due to a health issue. While you do not have to pay for this leave, you are required to keep these employees on their health insurance plans. Learn more here. COBRA. If your business employs 20 or more workers, then your employees can maintain their health insurance plans for up to 18 months after leaving your company (in addition, some states require employers to provide paid sick leave). Plus, if your small business has 50 or more employees, you are also required to offer some form of health insurance—or face a tax penalty. This is currently the law under the Affordable Care Act, though it may be subject to change in the coming months or years. Company benefits stats prove out that, generally speaking, spending on your workers will pay it forward for your business down the line. Whether that means going the extra mile to secure a health insurance plan that will actually help your employees the most, offering wellness benefits to increase engagement, or including packages for commuting, skill development, and more, It is up to what you can afford, what your employees want, and what your brand matches up with. This doesn’t mean you should spend every cent you make on employee benefits, of course, but you should get away from the “small business owner grind mindset” from time to time and recognize that focusing on employee happiness, wellness, and culture will pay dividends as you grow. This post was written by Ben Rashkovich. Ben has written and edited articles on entrepreneurship, small business, finance, alternative lending, and more for publications like Fit Small Business, the Fundera Ledger, Forbes, Business Insider, Huffington Post, and more. Previously, he served as the Content Strategy Manager for Fundera, worked on eBay’s curatorial team, and reported for the Columbia Spectator.